Republican gubernatorial incumbents seem to be doing fairly well throughout the Northeast despite a challenging environment. The leader of the Northeast Republican pack is Massachusetts’ Charlie Baker. With polls consistently finding he’s the most popular governor in the country, Sabato’s analysis has moved his re-election bid from “likely Republican” to “safe Republican.” And while everyone can’t be Charlie Baker, the other two New England GOP incumbents– Sununu and VT governor Phil Scott–are in pretty good shape. Gov. Phil Scott (R-VT) is just a little less of a favorite than Baker in liberal Vermont, but his strong position matches our Likely Republican rating in the Green Mountain State. We’re also holding Govs. Chris Sununu (R-NH) and Larry Hogan (R-MD) at just Leans Republican, but their approval ratings are strong and their opposition uncertain. Republican incumbents in these four states remain well-positioned overall, even though three of them are among the most Democratic states in the nation, and the fourth (New Hampshire) is typically hyper-competitive and has voted Democratic in the last five presidential elections. The Democrats’ advantage in the generic ballot dipped from 16 points in February to six points in March to just three points now. 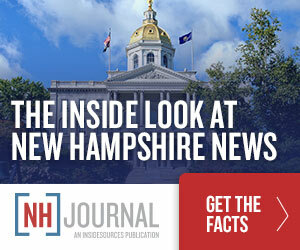 As NHJournal has previously reported, Gov. Sununu’s approval rating doesn’t appear to be tied to President Trump’s. And poll pros note that the generic ballot average is still between 6-7 percent pro-Democrat and hasn’t changed much in the aggregate. A strong anti-Trump, pro-Democratic tide could sink all GOP ships. The fact that this passion appears to be waning is good news for the GOP everywhere, but especially in blue New England. The bad news? It only takes one Trump tweet to bring it back. In 2018, no Republican is safe.